Sourwood nectar yields one of the most prized honeys on the east coast. Oxydendrum arboreum tolerates shade well but requires acidic soils. It typically forms a cone shaped canopy that is between 25-40 feet tall with a width of 25 feet. An important note is that these trees are notoriously hard to transplant successfully. If transplanting is successful, sourwoods grow (relatively) very slow so careful consideration of planting sites is prudent. In fact, an arborist I called to the farm for professional advice on an unrelated matter basically told me I was wasting money by trying to grow sourwoods. He was friendly and incredibly knowledgable. Regardless, challenge accepted! Notice how the natural distribution swings around the Shenandoah Valley. 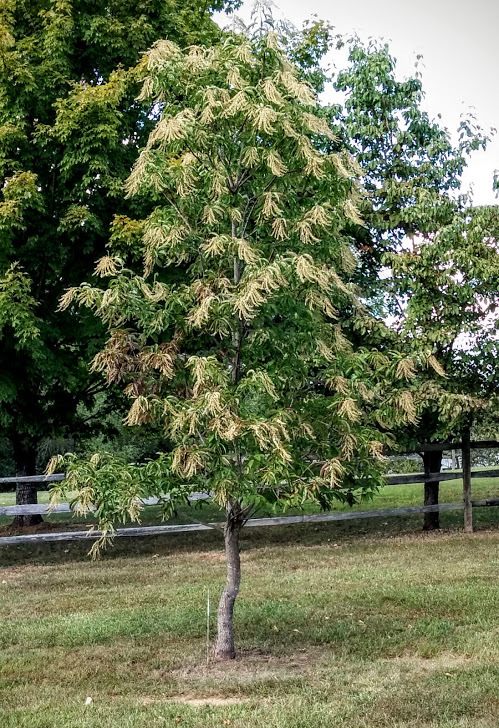 “In the Garden: Sourwood” from the nearby Crozet Gazette notes that exact point and speculates that the soil is the limiting factor in this region of Virginia. I would agree, especially noting how the tree grows through the Roanoke and New River Valleys to the south. Geology is what I believe is the differing factor. Where the limestone parent material of the Shenandoah Valley yields alkaline soils, the two valleys to the south are sandstone/shale which produces acidic soils. Moral of the story: it will be a fun challenge as a passionate but amateur botanist and silvoculturalist! Those epicormic sprouts shooting for the space opened to sunlight by awful pruning practices lead to a never ending battle. Plus removal would waste its slow growth rate and difficult establishment! So for now, it will be planted between the farm entrance road and the fence along the main road where it’s form won’t reach out to disturb vehicles on either. It also could be planted beneath the huge and fast growing basswoods where its slow growth rate would keep them from competing vertically but the different soil requirements make this plan more work than it is worth. Instead, sourwoods will also be planted to form the border of the pasture along the fenceline so bees can maximize the June to July nectar flow. After seeing the blooms of sourwood for the first time while researching some specifics of this post, I then noticed this specimen in my parents’ neighborhood located in Northern Virginia. I confirmed the identity by tasting the leaf! I hope you find this constructive, but it seems that sourwood trees only make nectar when grown at elevations higher than 1,100′. I don’t know your farm elevation but it would not be fun to invest the years into sourwood trees and find that you’re too close to sea level. Thank you for pointing that out as I had not heard before. Luckily the farm is at about 1300 feet however I will likely not proceed with sourwoods at a large scale due to the slightly alkaline soil in the shenandoah valley. Basswoods and sumacs should have no complaints with that soil property though! Due to my love of chestnut trees which also prefer soil on the acidic side of neutral, I am considering looking for a small property where I currently live and work. I am only about an hour away from the farm that is the subject of this blog. It is outside of the valley and judging by all of the rhododendrons in the forests and the chestnuts in this city, the soil seems to be right.